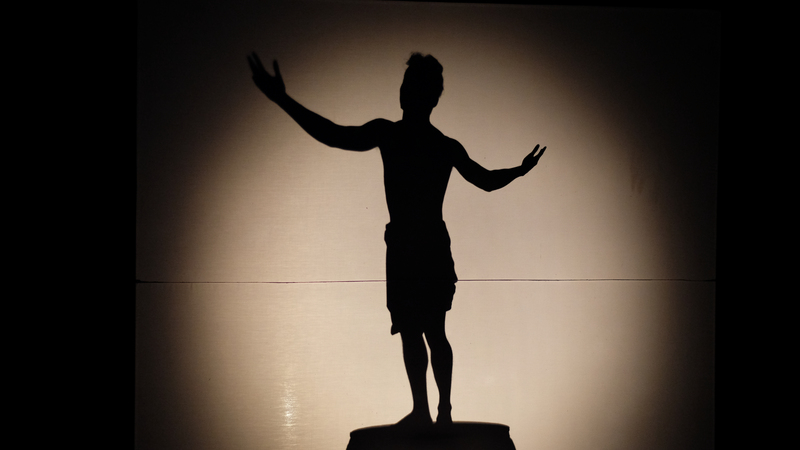 Our first stop was the Phare Circus. 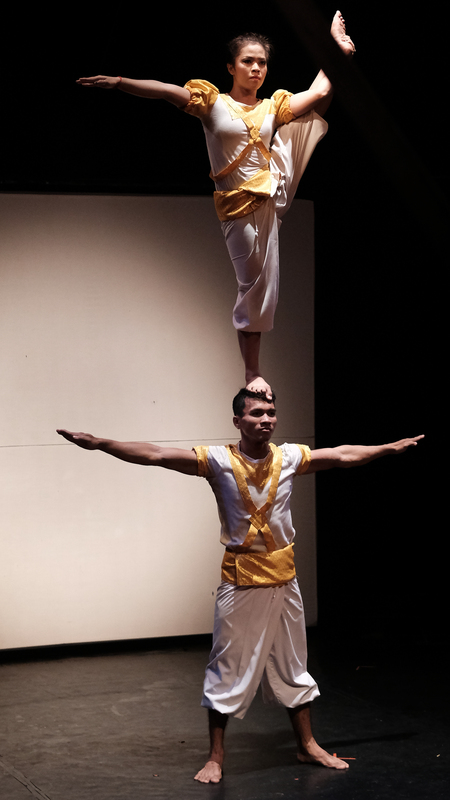 Run by the Phare Ponleu Selpak organisation, it offers multidisciplinary schooling to young people which allows them to make a living through art. 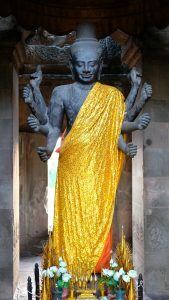 Those taught typically come from poor backgrounds and the education is focused on self-realization and durability. Classes are given in subjects like theatre, acrobatics, music and a variety of art disciplines. 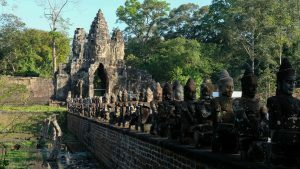 The next day we were up early for a 0630 departure to start our visit of the Temples of Angkor. 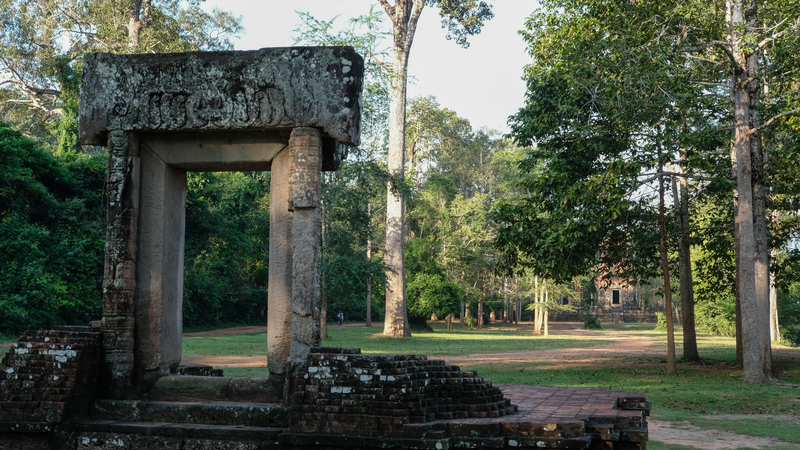 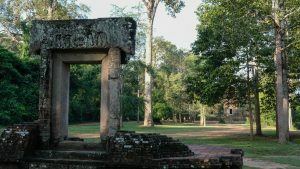 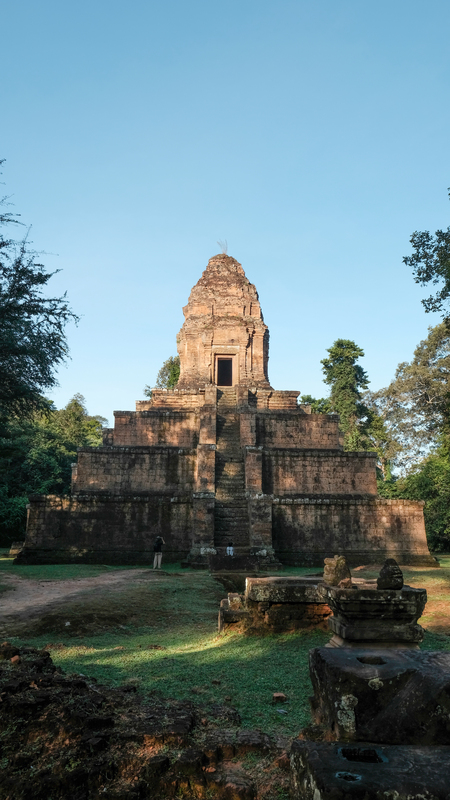 Our first temple was a small structure on the way to Angkor Thom and was one of the earliest to be built. 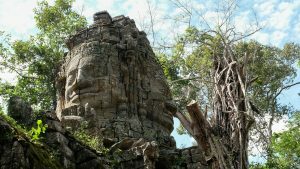 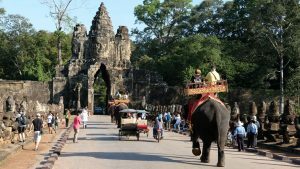 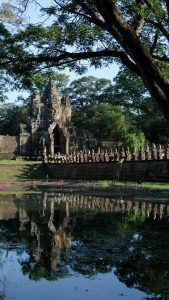 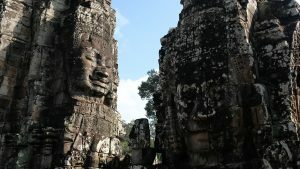 We then approached the splendour of Angkor Thom, which was the last and most enduring capital city of the Khmer empire. 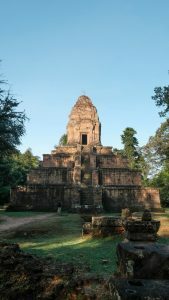 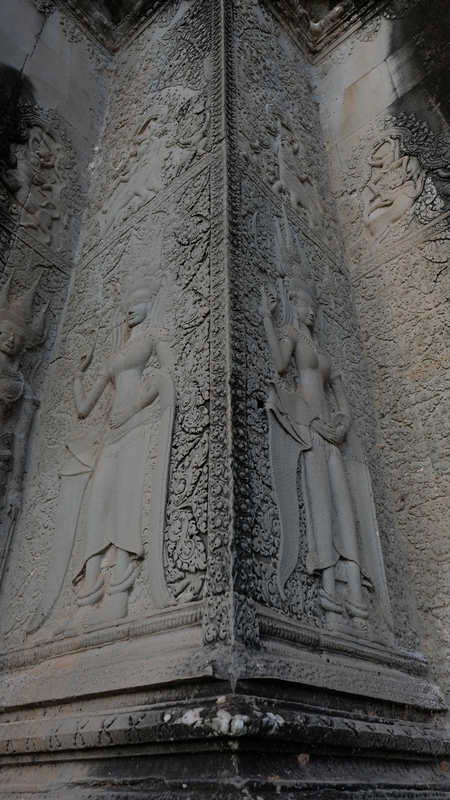 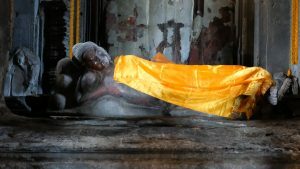 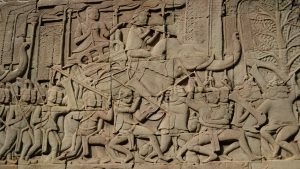 It was established in the late twelfth century by King Jayavarman VII; covering an area of 9 km² it became the capital of Jayavarman VII’s empire. 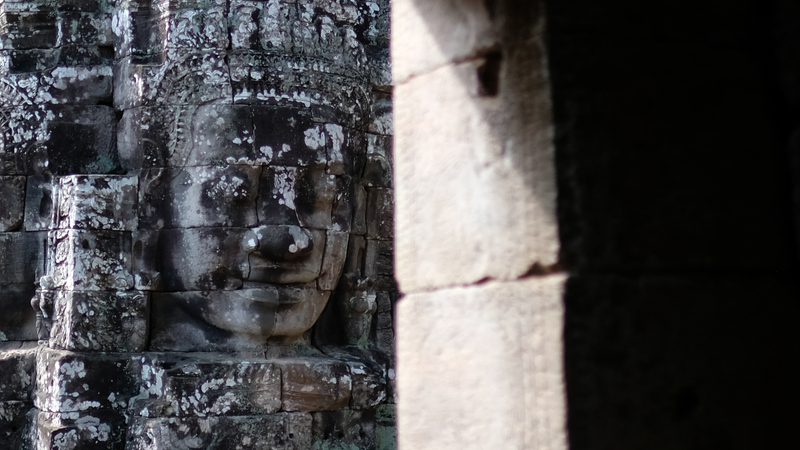 At the centre of Angkor Thom stands the Bayon. 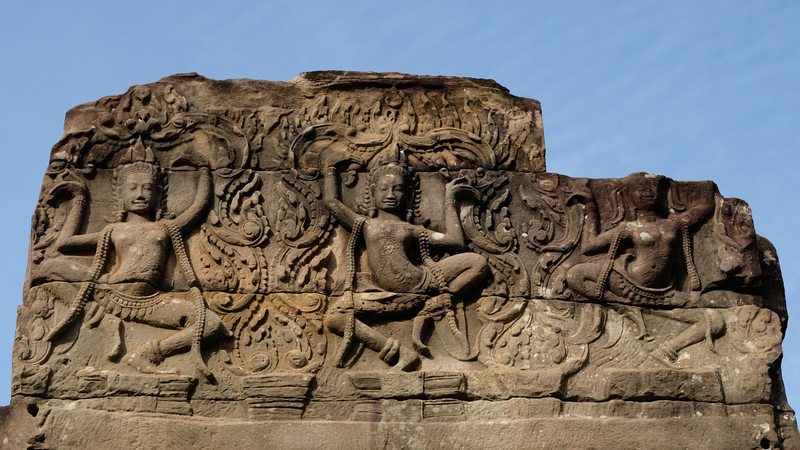 A richly decorated Khmer temple it was modified and augmented by later Hindu and Theravada Buddhist kings in accordance with their own religious preferences. 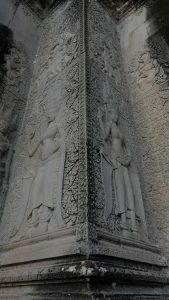 It has some fantastic bas reliefs which tell various stories both historical and mythological, as well as the mundane. 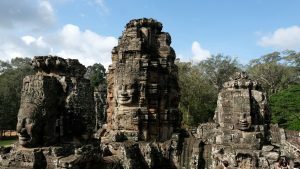 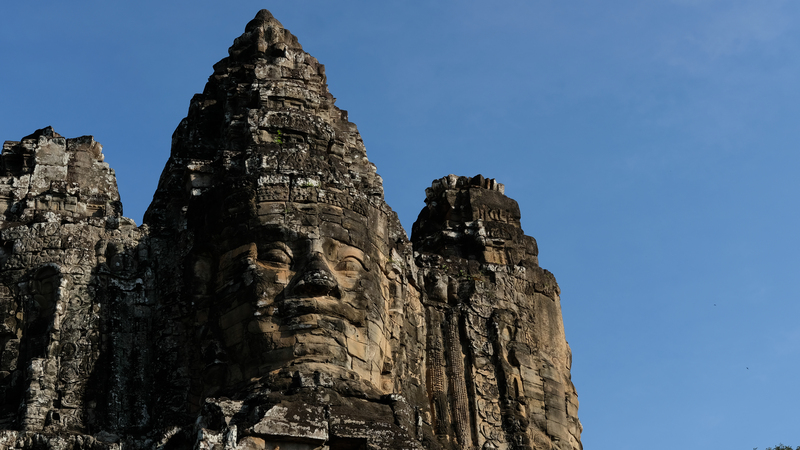 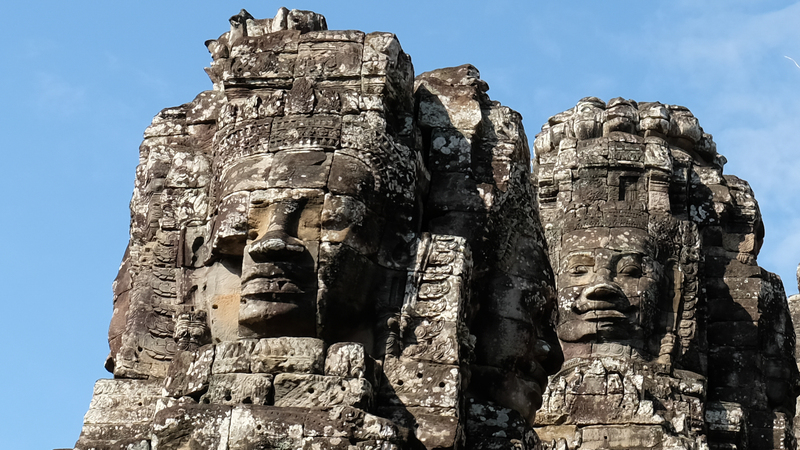 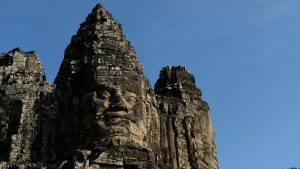 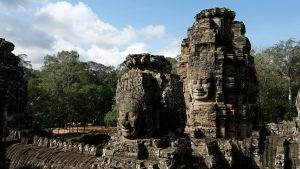 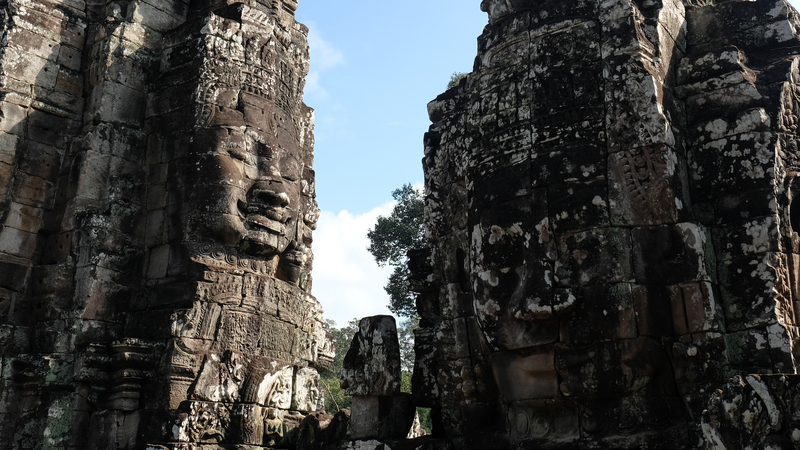 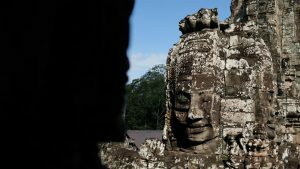 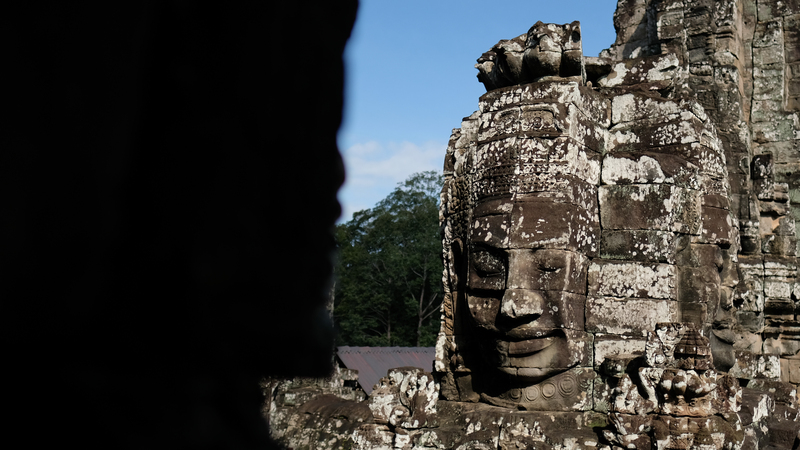 The Bayon’s most distinctive feature however is the multitude of serene and smiling stone faces on the many towers which jut out from the upper terrace and cluster around its central peak. 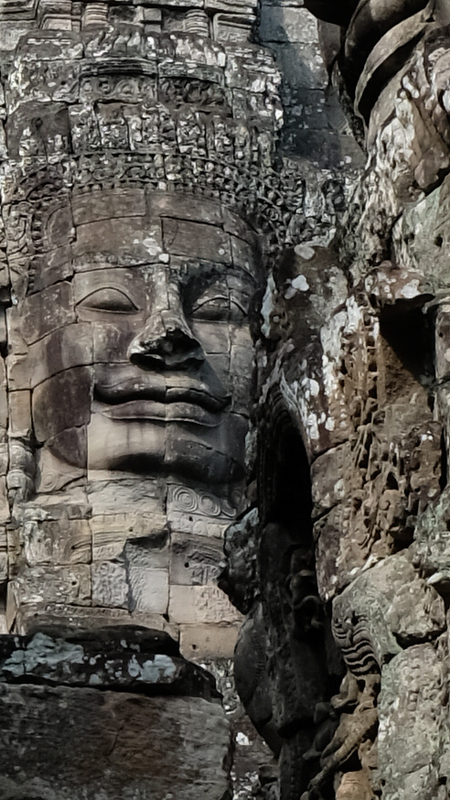 There were originally over 200 smiling faces on the temple but not all remain. They are a truly amazing sight. 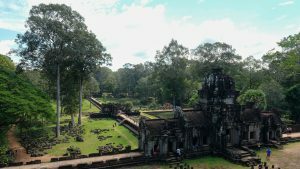 So despite the heat we headed over to the Baphuon. 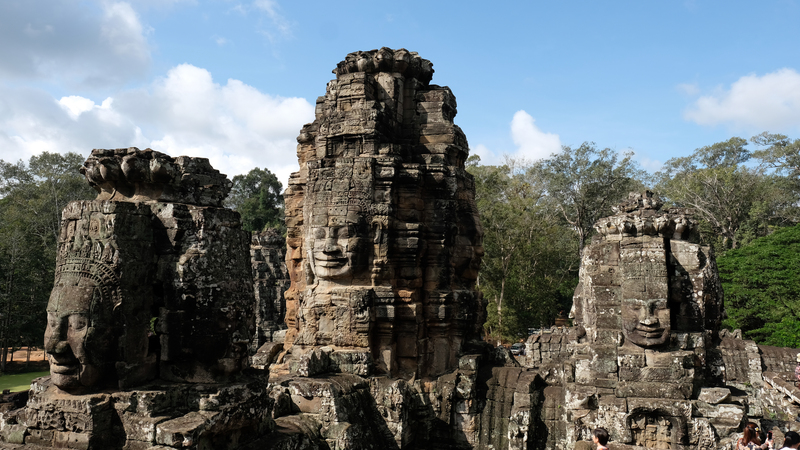 The Baphuon is located within Angkor Thom to the northwest of the Bayon. 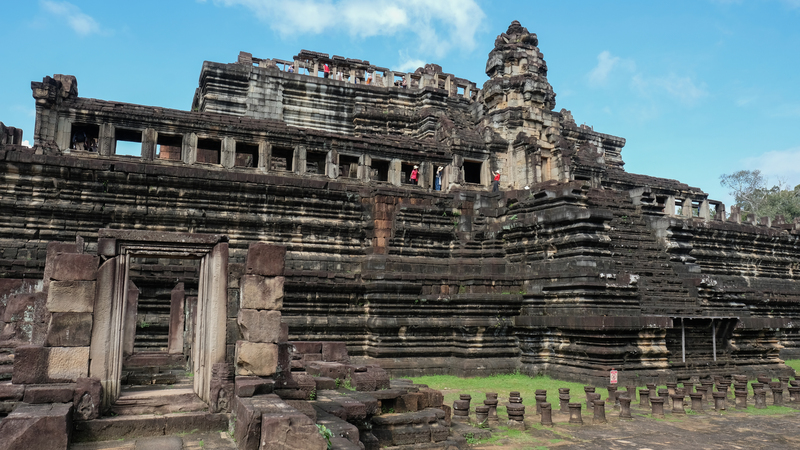 Built in the mid-11th century, it is a three-tiered temple mountain dedicated to the Hindu God Shiva. 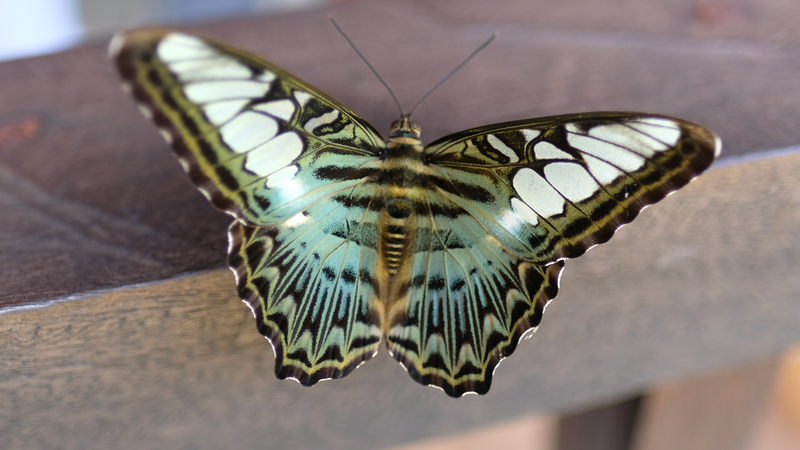 And despite the heat we went right to the top where we were rewarded with both views over Angkor and a peaceful butterfly. 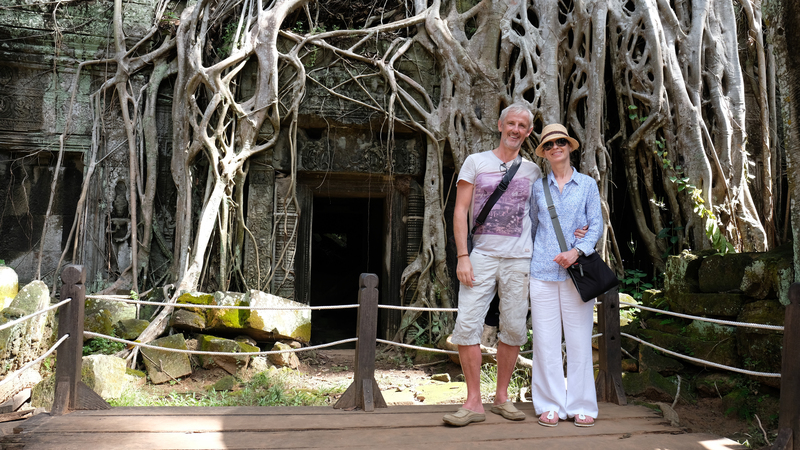 But it was very, very hot up there….. and we still weren’t finished for the day ! So despite the intense heat and humidity we soldiered on to Ta Prohm. 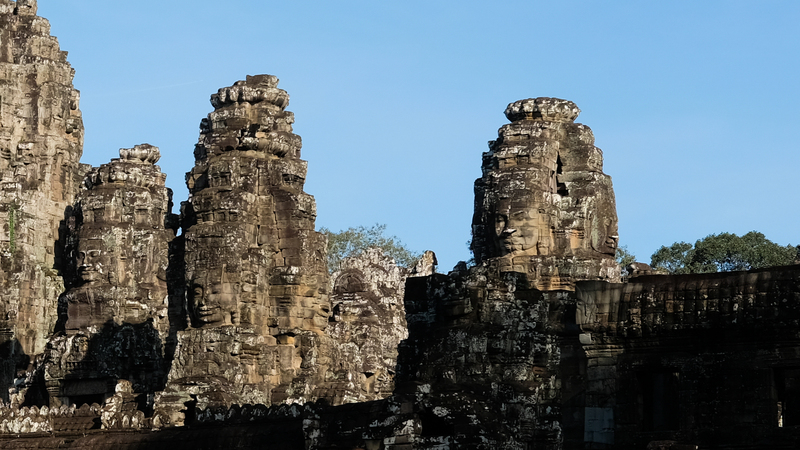 Commonly know as the ‘Tomb Raider’ temple, it was made famous in the film of the same name. 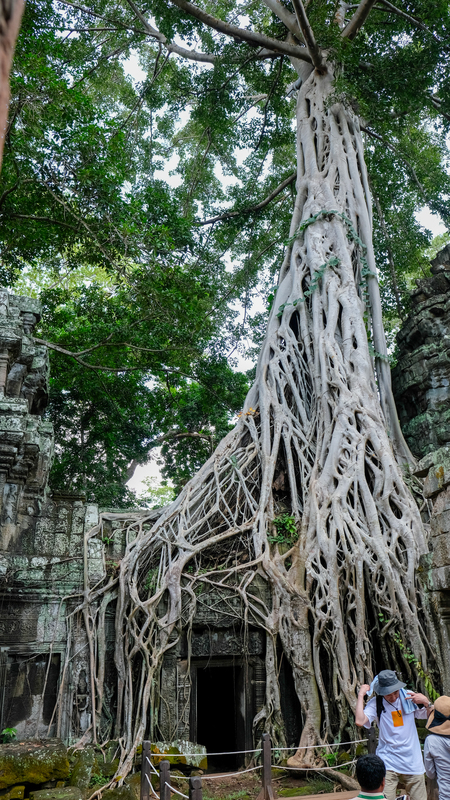 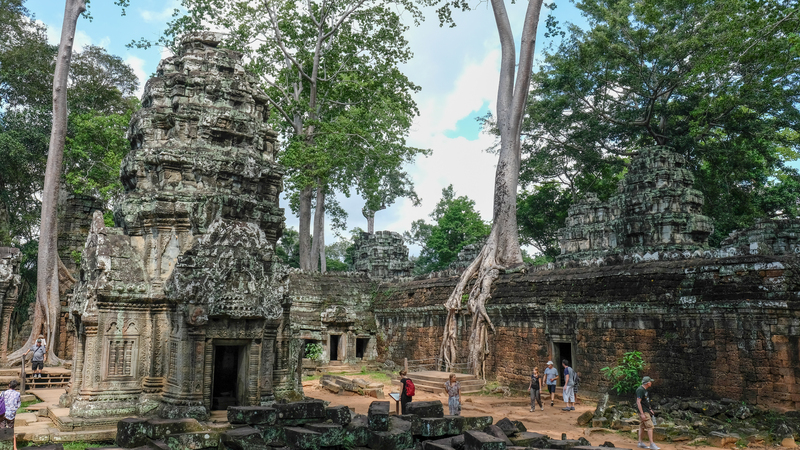 After the fall of the Khmer Empire in the 15th century, the temple of Ta Prohm was abandoned and neglected for centuries. 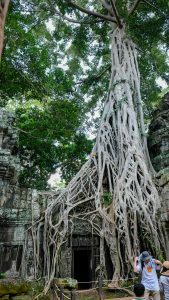 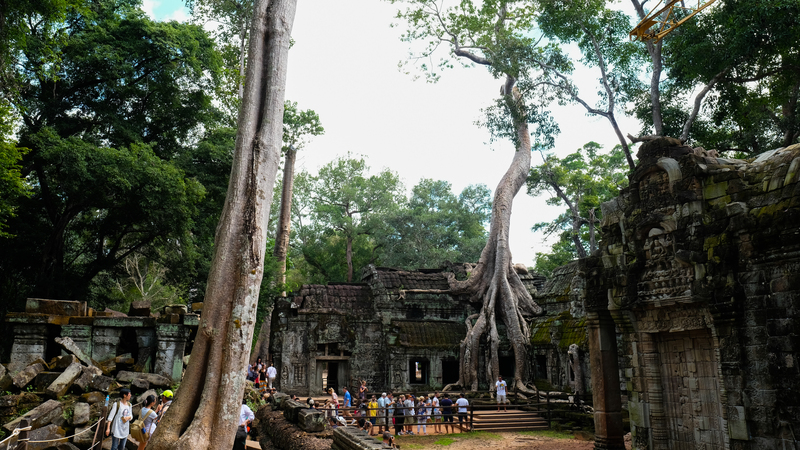 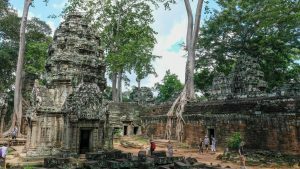 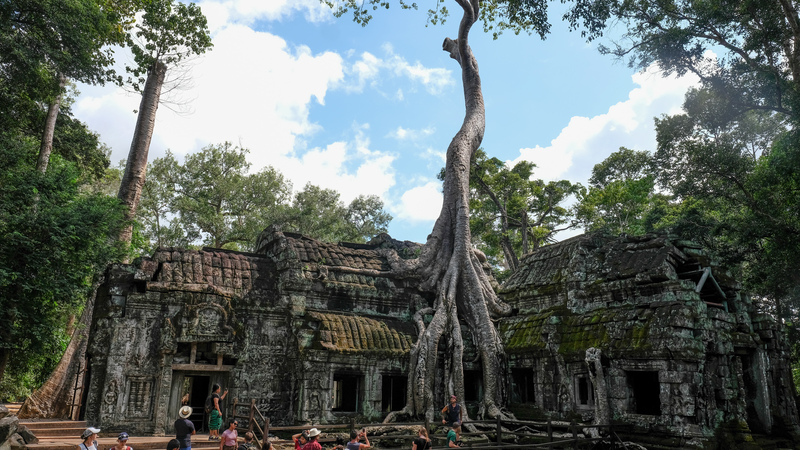 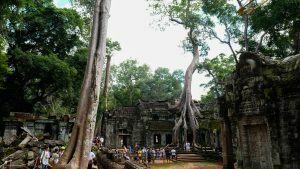 Today the photogenic and atmospheric combination of trees growing out of the ruins and the jungle surroundings have made it one of Angkor’s most popular temples with visitors. 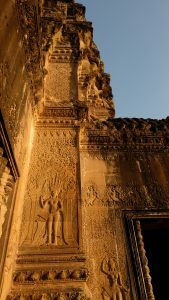 We entered via the lesser used North Gate and we were on our own as we skirted the 1 km outer wall before reaching the grand entrance. 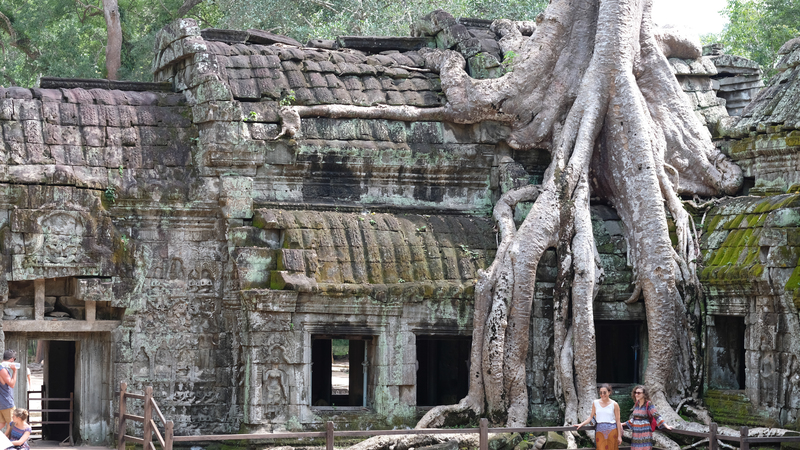 Once inside we were treated to the fantastic sight of the trees which have reclaimed the temple ruins. Now most sane people would think that that was enough excitement for one day. 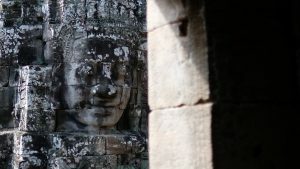 But no ! 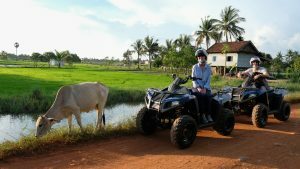 We returned to the hotel for a quick freshen up and then it was out for our evening excursion – a quad bike trip around the countryside of Siem Reap ! We toured around paddy fields and dusty lanes, chatting to the odd cow along the way ! 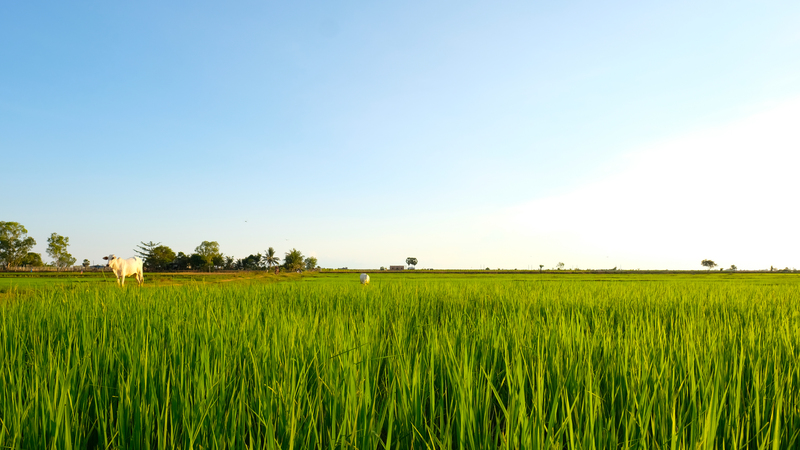 We also discovered that a Cambodian rice farmer only earns 150USD wholesale for 1000kg of delivered rice. 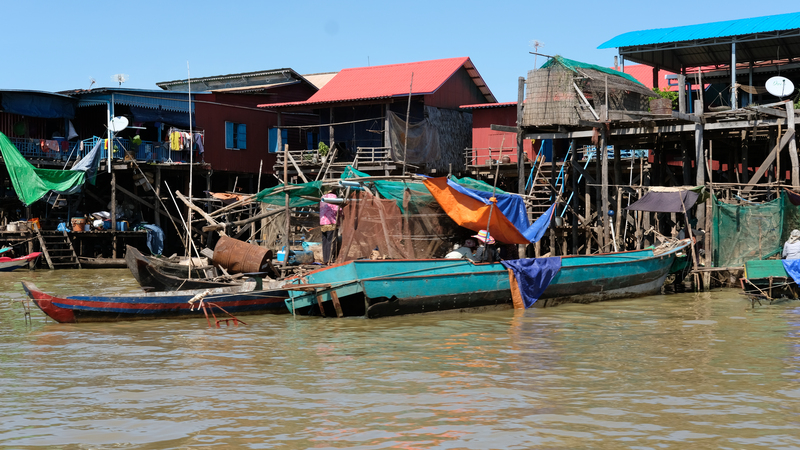 As nearly all of the farming is done by hand or with simple tools, this is a very harsh way to have to make a living. 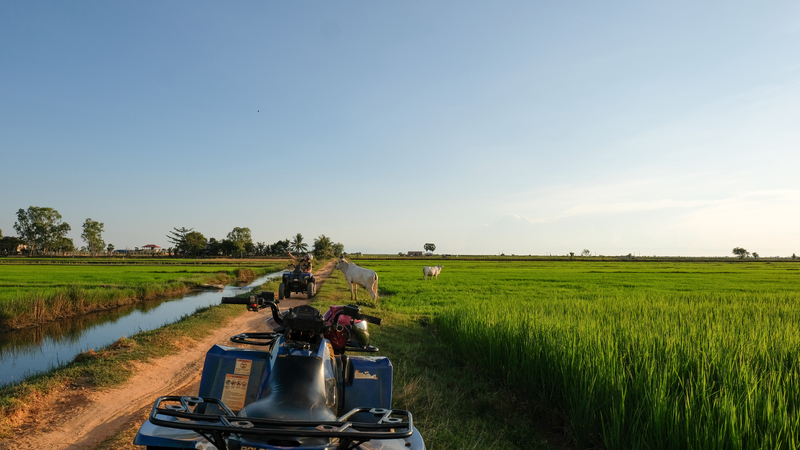 The scenery was lovely and it was very peaceful once we were away from the main road through Siem Reap. After about an hour and half of cruising around (well bouncing really) we travelled back to the hotel. 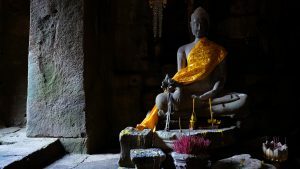 Finally it was time for dinner then bed ! 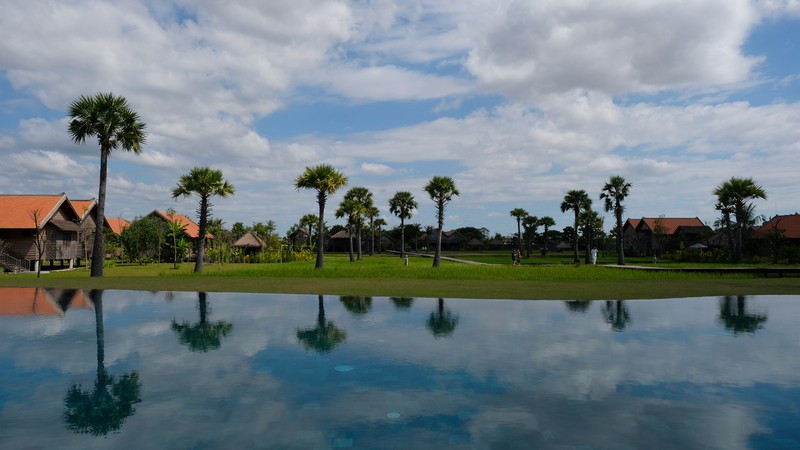 Not bad for our first day – but there was much more to come in the morning ! 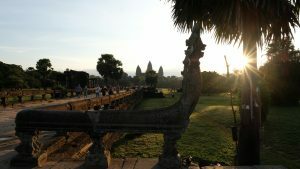 Day Two in Siem Reap started early – very early – 0400 early !! Which is a good 45 minutes before we have to get up for work on the dreaded Monday morning !! 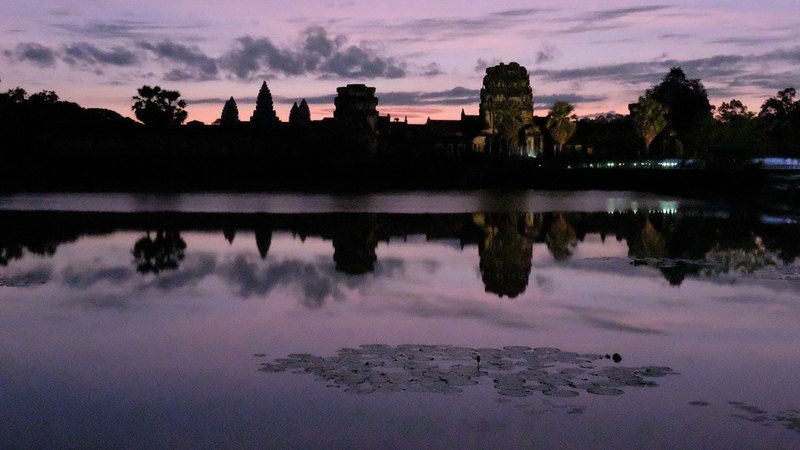 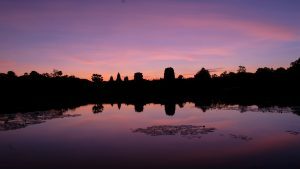 But it was all worthwhile as by 0510 we were sat by the lake waiting for the sunrise over Angkor Wat. And that magical hour before the sun came up treated us to a beautiful array of constantly changing colours which was just stunning. As the sun finally rose we started to make our way toward the temple city of Angkor Wat, but by a side route, thus avoiding the main tourist entrance. 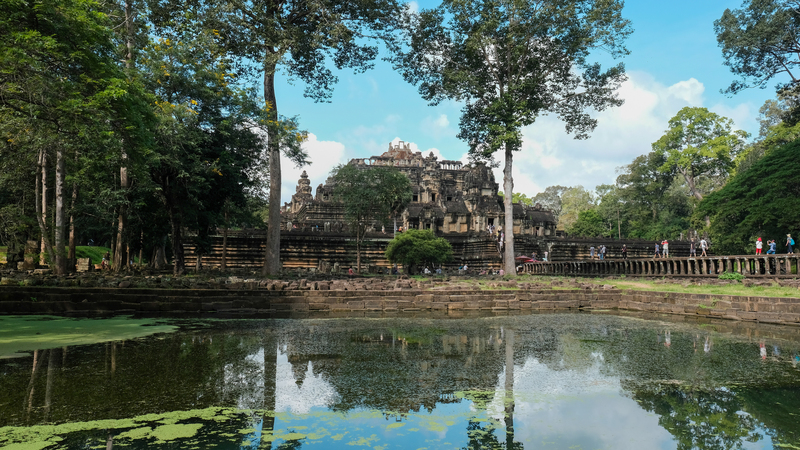 Angkor Wat measures 162.6 hectares and was originally constructed as a Hindu temple dedicated to the god Vishnu, gradually transforming into a Buddhist temple toward the end of the 12th century. 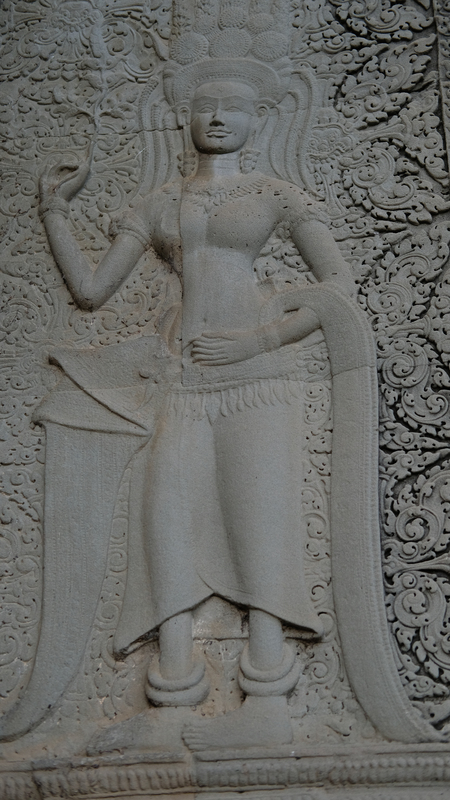 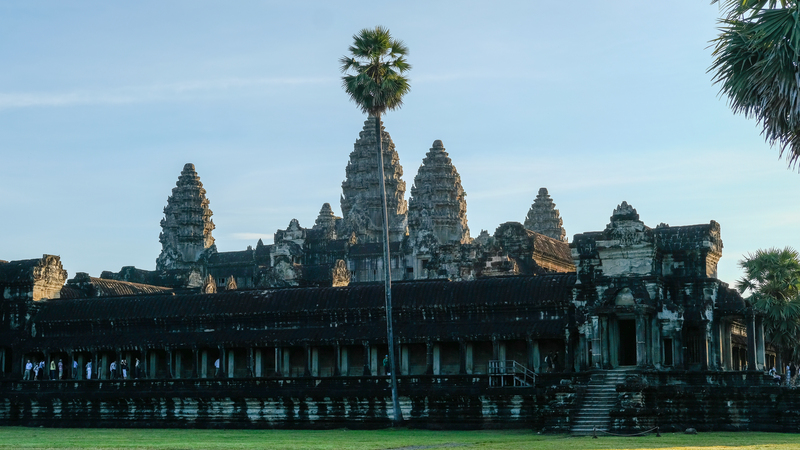 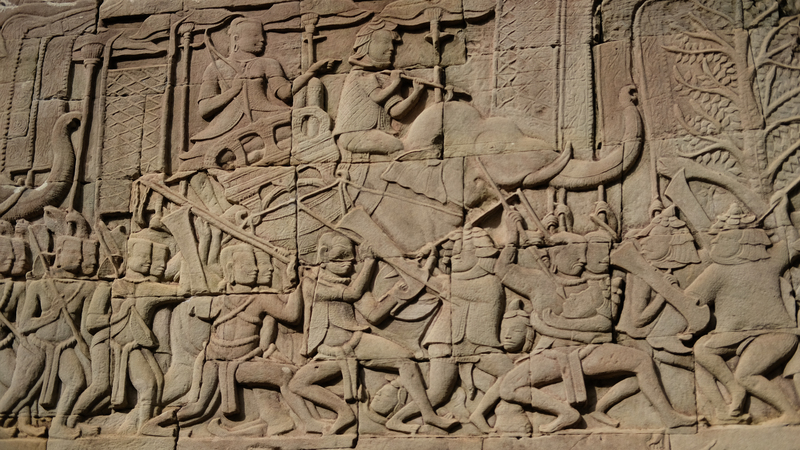 It was built by the Khmer King Suryavarman II in the early 12th century as his state temple and eventual mausoleum. 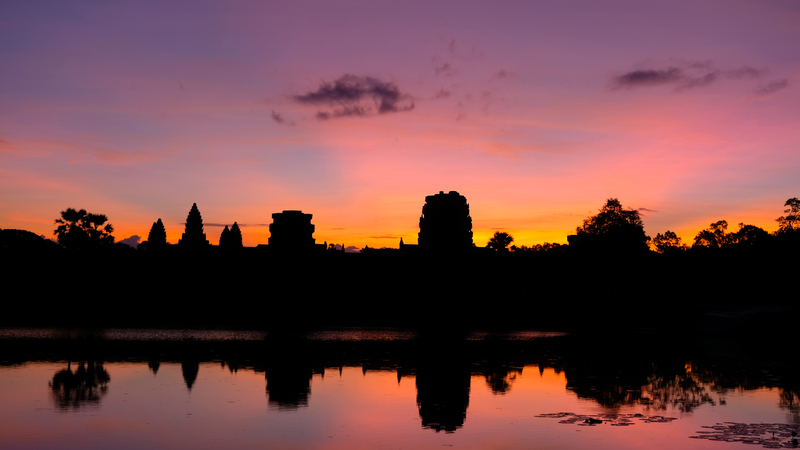 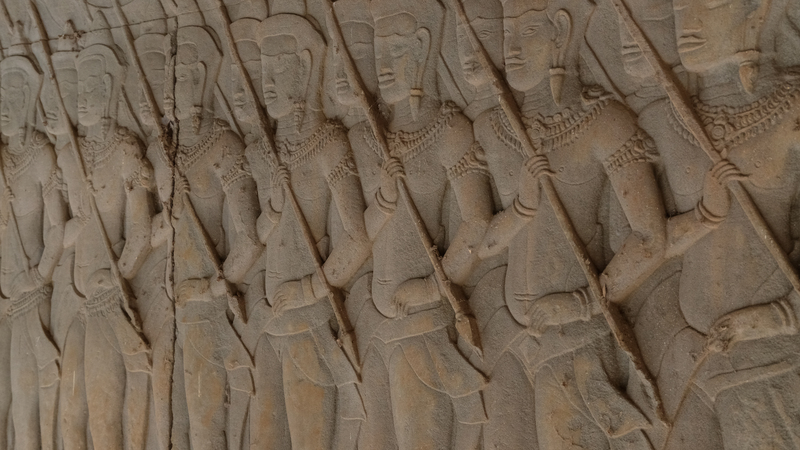 Breaking from the Shaiva tradition of previous kings, Angkor Wat was instead dedicated to Vishnu. The temple is designed to represent Mount Meru, home of the devas in Hindu mythology: within a moat and an outer wall 3.6 kilometres long are three rectangular galleries, each raised above the next. 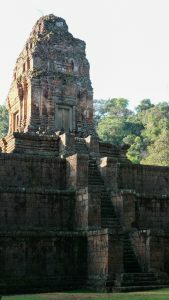 At the centre of the temple stands a quincunx of towers. 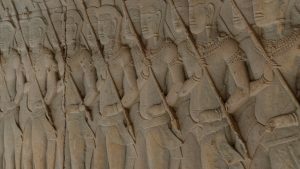 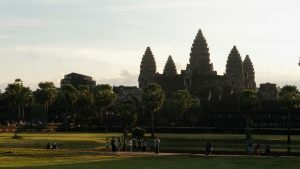 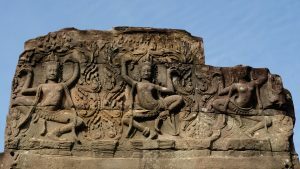 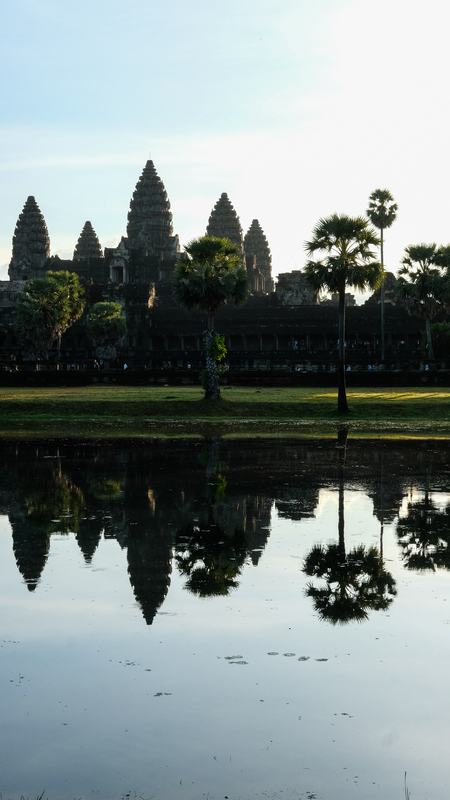 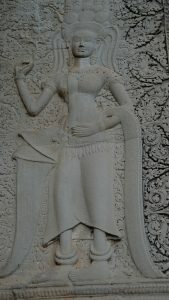 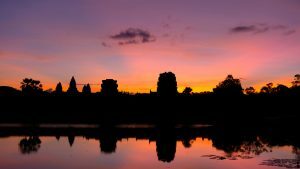 Unlike most Angkorian temples, Angkor Wat is oriented to the west and scholars are divided as to the significance of this. 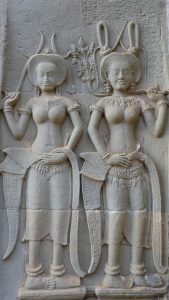 The temple is admired for the grandeur and harmony of the architecture, its extensive bas-reliefs, and for the numerous devatas adorning its walls. Also within the temple are many statues of buddha, signifying its later move away from Hinduism. It proved to be a fabulous place to visit and well worth the very early start ! 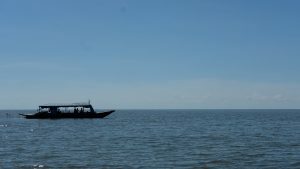 The afternoon took us away from the Angkor Temples and to the largest freshwater lake in Southeast Asia – the Tonlé Sap lake. 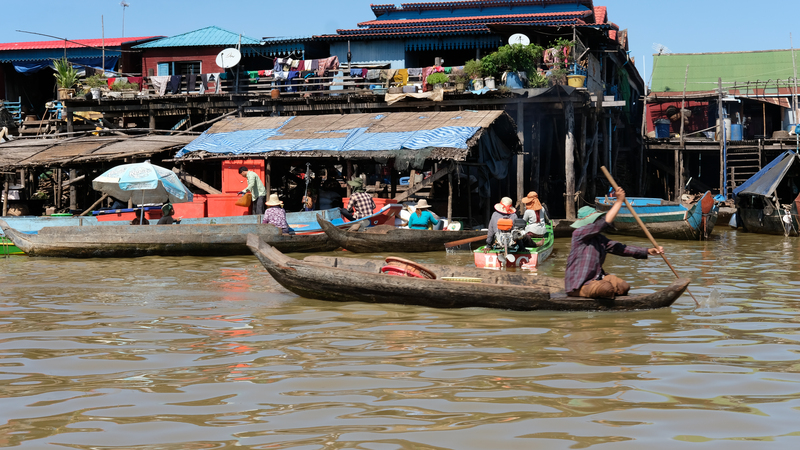 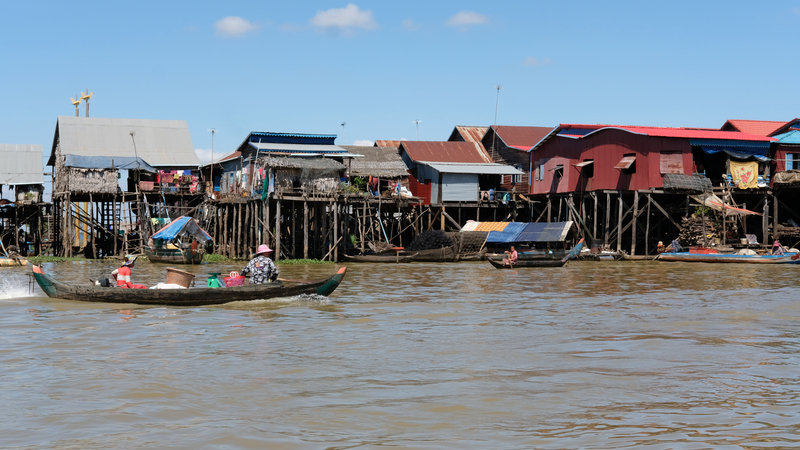 The Lake and it’s attached river, the 120 km long Tonlé Sap River which connects the lake to the Mekong, forms the central part of a complex hydrological system. 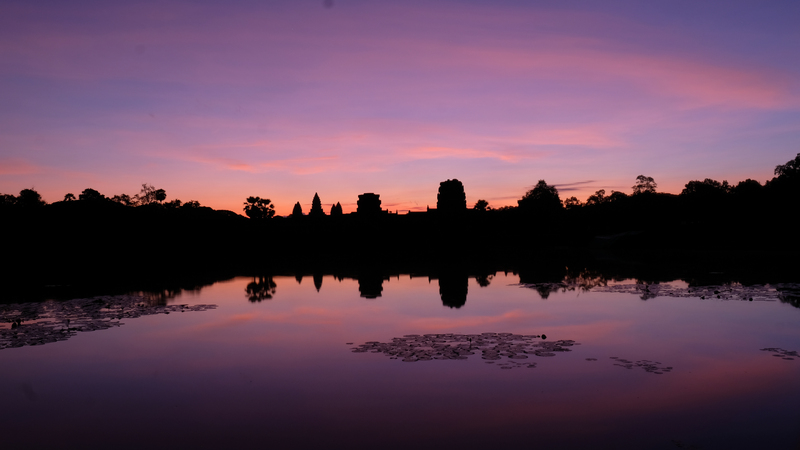 Situated in the 12,876 km2 Cambodian floodplain, it provides a multitude of natural and agricultural habitats. The lake’s size, length and water volume varies considerably over the course of a year from an area of around 2,500 km2 at the end of the dry season in late April, to an area of up to 16,000 km2 in September and early October. 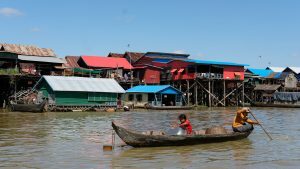 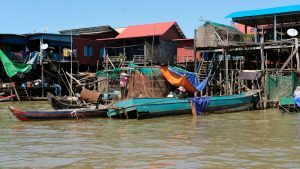 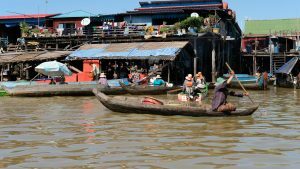 Importantly, the river and lake is home to around 3000 families who work and live on the river in their stilted houses and boats. The wealthier families can afford corrugated roofs and concrete posts, rather than just wooden ones. 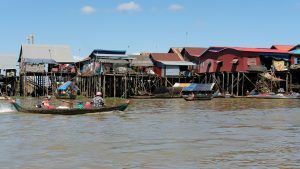 We saw kids paddling themselves to school, people bathing in the river, as well as an array or fishermen working on the days catch. 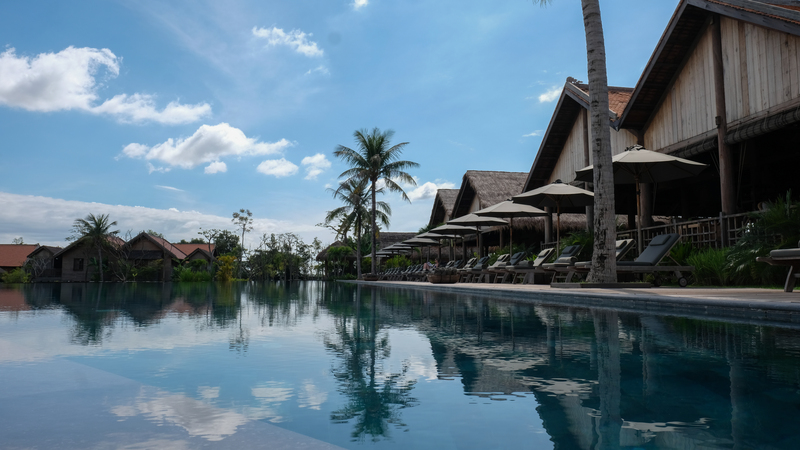 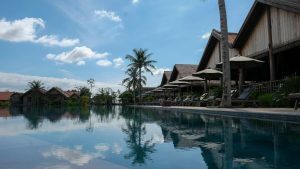 So after two very full days in Siem Reap we spent our last day lounging around the pool. 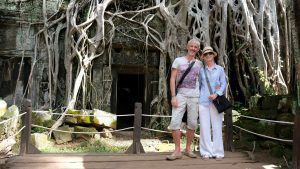 before heading off into town for our last evening. 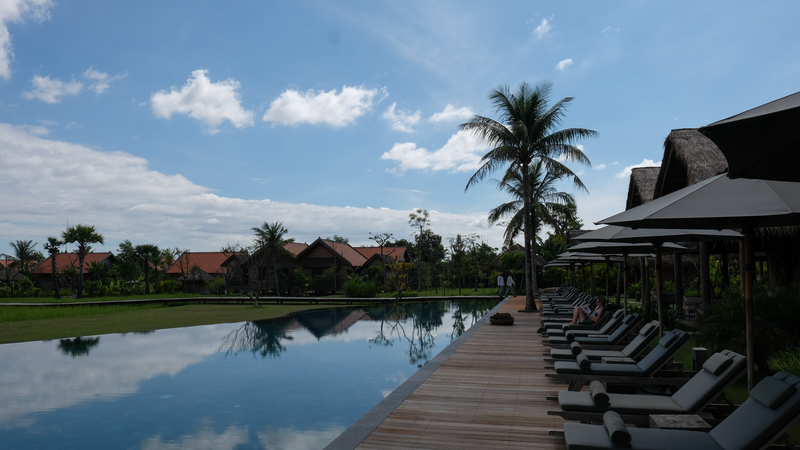 The hotel was very quiet which was lovely but we did share it with 10,000 insects and frogs which greeted us warmly on our return ! 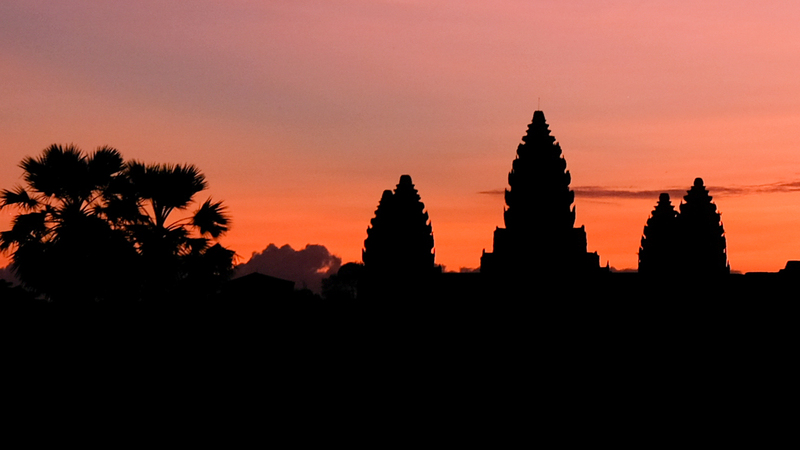 and with that we concluded our Cambodian adventure and moved on ! 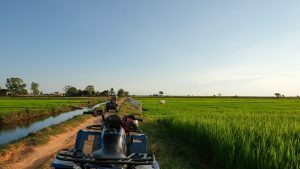 I am having a struggle keeping up ! 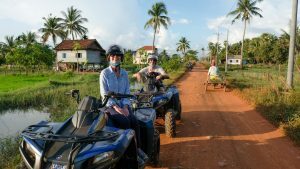 – But I am still enjoying the ride ! 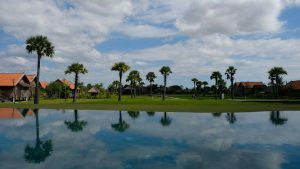 What a fantastic day ! 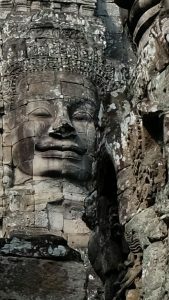 Great experience.